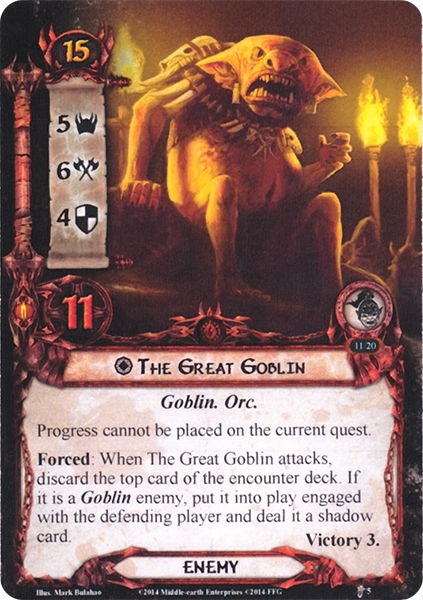 One of the most gratifying developments in The Lord of the Rings: The Card Game has been the decision by the developers to embrace variable difficulty. We all know that this can be a punishing game for newcomers, and it can sometimes even turn people away because of the learning curve that is required. On the other end of the spectrum, veteran players taking full advantage of a larger card pool may become bored with older quests. Even worse, some older quests may be burdened with flawed mechanics or poor balance that keep them banished from the playing table. This is where Nightmare mode comes in, as it introduces new encounter cards and new rules for scenarios, not only increasing the difficulty but also adding to their theme and playability as well. Each Nightmare quest is sold as a separate pack (once it becomes available to the public at large) and contains around 20 new encounter cards. A rules card is included with each pack that lists which cards should be removed from the old version of the encounter deck and any new rules that will apply. This means you do need the original version of a particular scenario in order to play the Nightmare edition. * Challenge: How difficult is the quest? Keep in mind that this is a relative scale, so a rating of 1, for example, doesn’t mean that a quest is a cakewalk. Rather, it means that it is less difficult than other Nightmare quests. * Theme Improvement: Just like it sounds, this rating assesses how much the Nightmare version improves the general theme and “feeling” of the quest. * Gameplay Improvement: How much does the Nightmare version improve the way the quest plays? This deals with game balance, fixes to mechanics, etc. * Fun Factor: How fun is the Nightmare version of the quest? This takes into account the balance between frustration/challenge and the likelihood that players will want to repeatedly pull this Nightmare scenario out of the box again and again. Overall Thoughts: The original version of Passage Through Mirkwood is essentially the “tutorial” level for LOTR LCG. As such, after you begin to get to grips with the difficulty, it soon loses much value other than as an introductory quest when showing the game to new players or as a quick testing site for new decks. The Nightmare version adds some much-needed teeth and challenge to the scenario, making it playable for veteran players and thus essentially “adding” a scenario back into your collection. Nightmare Passage Through Mirkwood seizes on the “exhaustion” aspect of the original quest and takes it to a whole new level, seeking to exhaust your characters at every opportunity and punishing those that are already exhausted. This really helps to impart the sense that you are battling against spiders that are seeking to trap you and catch you in their webs, more so than the old version. The new version of Ungoliant’s Spawn is particularly nasty, subtracting 2 willpower from each questing character, and discarding anyone with 0 willpower. 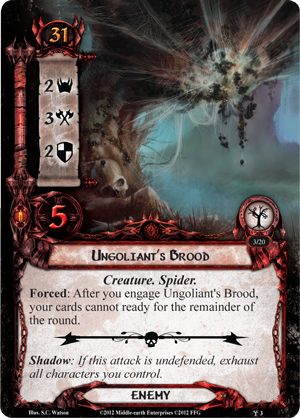 On the negative side, there may be playthroughs where you manage to avoid most of the Nightmare cards, including Ungoliant’s Spawn, which may make for a lukewarm experience (this is more a problem in solo than multiplayer). Still, this is one of the best Nightmare packs in terms of pure added value, as it breathes new life into a quest while still being accessible and enjoyable for a broad range of players. Overall Thoughts: Journey Along the Anduin is still one of the most intriguing and enjoyable quests around, and so the Nightmare version faces the tall task of trying to improve upon it. On the one hand, the designers have been very successful in improving the sheer challenge of this scenario. The first time you draw a copy of the 10 threat Gladden Marshlands location included in this set, you will be quickly served a slice of humble pie. Additional troll enemies and new foes with interesting mechanics, such as the Marshland Outlaws and Brown Water Rats freshen up the quest, adding new flavor in case you’re sick of Wargs and Goblin Snipers. On the other hand, the additional enemies, locations, and treacheries don’t substantively add to the theme (some feel a bit out of place in Tolkien’s world, to be honest) or dramatically change how the quest plays. This isn’t necessarily an indictment of the Nightmare version; it’s more a result of the solid experience provided by the original. Paradoxically, however, this is the Core Set Nightmare pack that I recommend most, especially for those players who are looking for a hefty challenge, as it requires tight deck building and strategic play to be successful. For example, the popular tactic of throwing a Forest Snare over the Hill Troll has been completely stopped by making all Troll enemies immune to attachments. On the flip side, if you already find Journey Along the Anduin satisfying in terms of its difficulty, then this one may not be for you. Overall Thoughts: Do you love it when your brains get bashed in by the game? Are you looking to prove your quality against the toughest this game has to offer? Then this quest just might be for you. 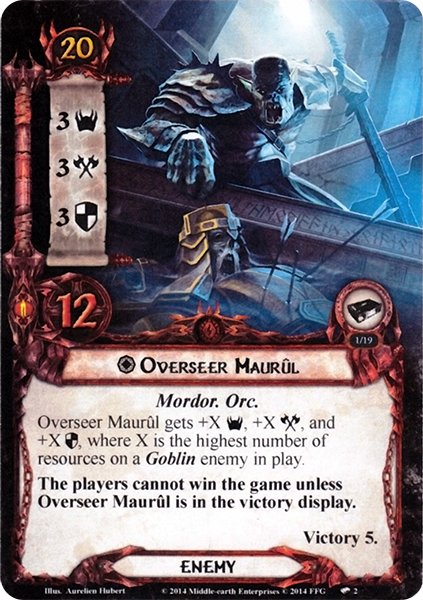 Nightmare Escape from Dol Guldur can make a strong case for being the most difficult scenario currently available, as even well-built decks will struggle against it. Success is possible, but it requires careful deck building and a fair share of luck. This is the main reason why I have docked this quest’s fun factor rating: the inconsistent start provided by the opening draw and the frustration that may set in for some players due to the difficulty may make this pack a nightmare for some…and not in a good way. The former is actually a feature of the original quest, as the encounter cards that are drawn to guard the three objectives have a disproportionate role in determining ultimate success. Unfortunately, this dynamic has not been changed by the Nightmare version. As for the enjoyment (or lack thereof) provided by the challenge, it all depends upon the tolerance of the individual player. I tend to have a bit of a masochistic love for the difficult quests, but I know that many players may feel a bit too annoyed by this scenario to pull it out consistently. There is one undeniable improvement that has been made to this quest though: enhancement of theme. The encounter cards really impart the feeling that you are exploring a dangerous dungeon and the pressing need to rescue the prisoner(s), from a Torture Chamber location that will kill all those captured after a certain period of time to a pesky Crazed Captive enemy that raises your threat if he is destroyed. Thus, those looking for the ultimate challenge or a quest dripping with theme (while not minding a rough ride) will want to pick up this pack. Overall Thoughts: While The Hunt for Gollum may have a warm spot in many players’ hearts because it was the first Adventure Pack and contained some brand new mechanics (for the time), such as hunting for certain objectives, it has not aged particularly well. 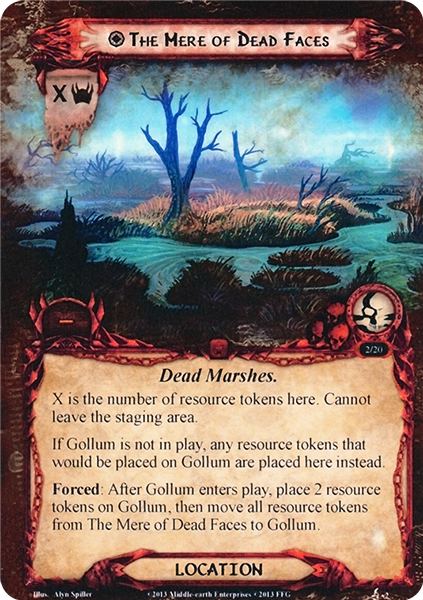 Current decks can blow away The Hunt for Gollum with little effort, and it has some notable flaws: a location emphasis that can easily be solved with Northern Tracker, Asfaloth, etc., and a lack of tension that can allow players to leisurely build up their forces. The Nightmare version adds a new twist to the quest whereby the Hunters from Mordor can collect Clue objectives just as the players can, which adds a needed sense of pressure to the quest. To add to this dynamic, the new Hunting Warg enemy forces you to kill it immediately, otherwise it brings out a copy of Hunters from Mordor at the end of the turn. This helps ensure that you see more Hunters, who are the main threat in terms of combat but sometimes don’t show up, and that the Clue objectives are contested. 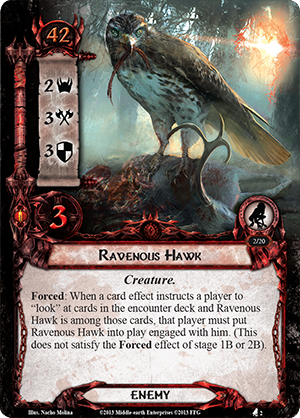 In addition, when you are searching through the deck for clues, which is part of the forced effects of stage 1 and stage 2, the Ravenous Hawk can fly screeching out of the encounter deck and engage with you. These new additions definitely add to the theme and feel of the quest, as players now feel like they are racing against other hunters rather than strolling through the wild, casually looking for Gollum. The tendency for location management effects to turn this quest into a formality has been mitigated by the addition of new locations with higher quest point values. The one possible negative here is that the quest is not quite as challenging as most of the other Nightmare scenarios, so those looking for a truly nightmarish experience should pick up one of the other packs first. However, this also means that Nightmare Hunt for Gollum is a good choice for those who are uncertain and want to dip their toes into Nightmare or for newer players looking for a challenge. Overall Thoughts: The original version of Conflict at the Carrock is one of my favorite scenarios all-time and is definitely my favorite of the Shadows of Mirkwood cycle. There is nothing quite like epic combat against massive trolls after all. It’s thus pretty impressive that the Nightmare version of this quest actually improves upon the standard version, introducing a “timer’ of sorts and new, powered-up versions of the unique troll enemies. Nightmare Conflict at the Carrock is a prime example of how the designers seek to undermine popular strategies for defeating a particular scenario. Generally, the best way to succeed at the standard version has been to spend as long as possible on the first stage, questing smartly and steadily building up an army until you can simply roll over the trolls during the second stage. However, in the Nightmare version, if you don’t put any progress on the first stage on a given round, a progress token is automatically put on it for you, which means that you have, at most, seven rounds to get your act together. Similarly, in the old version, the quest would get easier as you killed each subsequent troll. Things are turned on their head here, as each troll buffs the rest when it is put in the victory display, which helps to keep the tension and difficulty at a high level even as the trolls start to fall. If that wasn’t enough, Grimbeorn has been captured (so you can’t take advantage of his help), and there’s a brand new, final “boss” troll with two heads waiting for you at the very end! All in all, this makes for a challenging quest that will take all of your deck building and strategic prowess to beat, although it is more manageable than Nightmare Escape from Dol Guldur. There are just a couple of flaws to this pack. For one, it is sometimes difficult to keep track of all the different troll buffs and effects that are in play, and so it’s easy to forget something important and make a mistake. Second, this may just be a matter of personal taste, but some of the new elements seem more satisfying in terms of gameplay than thematically appropriate (i.e. 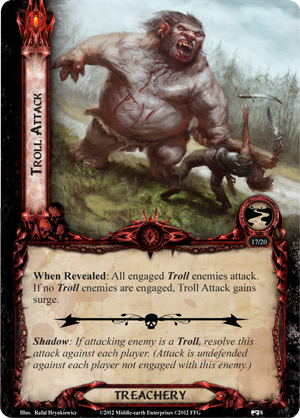 a two-headed troll is neat and fits with the text of The Hobbit, but feels a bit weird, and the swarms of non-unique trolls don’t quite jive with taking on a lone band of trolls). Still, this is probably my favorite of the Nightmare scenarios. Overall Thoughts: A Journey to Rhosgobel is a unique quest focusing on finding Athelas to heal the wounded Eagle, Wilyador. As such, creating a Nightmare version is tough as you don’t want to get in the way of what makes the quest distinctive, and there aren’t any notable flaws that need to be fixed. Thus, most of the Nightmare cards for this scenario revolve around inflicting damage on Wilyador or making healing him more difficult. Noxious Supplies for example, is a condition attachment placed on Wilyador that lowers the damage healed by a particular effect to 1, after which it is discarded from play. This can cause you to have to waste a valuable copy of Healing Herbs or Lore of Imladris for only 1 point of damage. 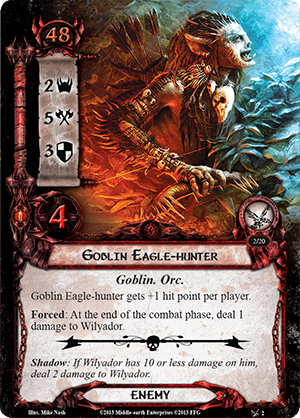 The Goblin Eagle-hunter is an example of the direct damage aimed towards Wilyador, dealing 1 damage to the poor Eagle at the end of each combat phase, so he needs to be destroyed quickly. All in all, these additions stay consistent with the theme and general gameplay of this scenario. That is both a positive, in that you get more of what you love, and a negative, in that it may not be enough of change for some players to warrant a purchase. It is, however, a good choice for fans of this particular scenario and those who want the challenge of Nightmare, but not the most brutal experience. Overall Thoughts: The original version of The Hills of Emyn Muil is often rated as one of the worst quests existing in the game. Its heavy focus on locations leads to a one-dimensional experience that is short on both difficulty and fun factor. Does the Nightmare version provide redemption? The short answer is yes. By introducing meaningful enemies, especially the terrifying Tunneling Nameless Thing, balance is added to the scenario, which prevents players from simply loading up on location management effects and extensive willpower and simply calling it a day. Beyond new enemies, perhaps the greatest improvement to this scenarios is the way in which the encounter deck has been dramatically cut down in size and made more consistent. This means that damaging treacheries from the original deck, such as Rockslide, come up far more often than they ever did before. When combined with the new Nightmare location, Brambles and Thorns, which deals damage to questing characters, direct damage becomes a nasty new aspect of the quest. There are a few missteps here. While most Nightmare scenarios tend to enhance the theme, this is a pack that actually detracts from the thematic coherence. 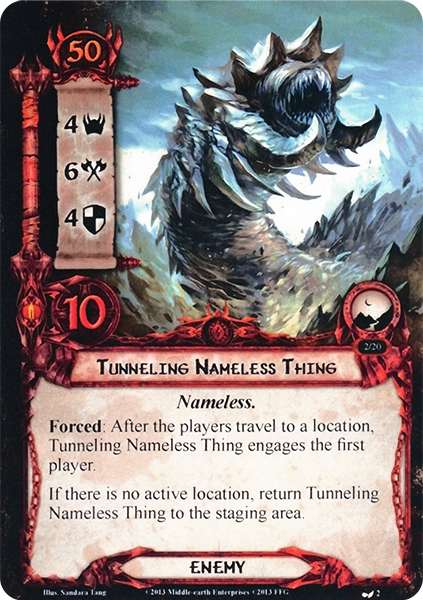 The Tunneling Nameless Thing is awesome in terms of a gameplay challenge, but feels completely out of place in the setting. In terms of gameplay, this scenario can become quite frustrating because of the victory point requirement to win combined with the new treachery, Retraced Steps, which discards a random location from the victory display. I’m not a huge fan of effects like this that cause you to lose ground towards an objective, as it often feels more frustrating and random than fun or challenging. Still, there’s plenty of value here when you consider that it effectively transforms a quest that is probably languishing in your collection into one that you will actually want to bring out and play. It is also fairly well balanced for different numbers of players, as pure solo players have to balance questing with combat capacity against the Tunneling Nameless Thing, while multiplayer participants have to face a chain of locations and nasty effects. Overall Thoughts: The original version of The Dead Marshes was quite honestly a disappointment. When you’re dealing with one of the most iconic characters in Tolkien’s world (Gollum) and finally getting to see him in card form, along with a unique and intriguing location like the Dead Marshes, this should be a recipe for a captivating quest. Unfortunately, the actual end product fell far short of the mark, despite an escape mechanic that was a decent idea. The main problem was that the quest was far too easy as long as you brought strong willpower and readying effects to the table. The Nightmare version of The Dead Marshes does plenty to rectify these flaws. 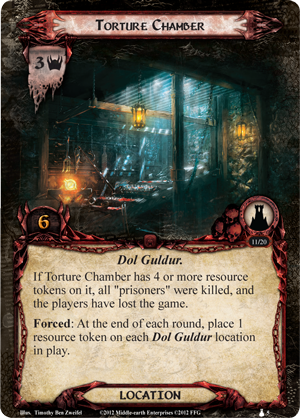 First, the brand new location, The Mere of Dead Faces, makes it far more likely that Gollum will escape, and actually makes the escape mechanic meaningful even when Gollum is not on the table. Second, the unique flavor of The Dead Marshes has been enhanced with the addition of brand new Undead enemies that are far more challenging and compelling than the old marsh worms that used to populate the scenario. In general, the new Nightmare effects on enemies, treacheries, and locations makes balancing questing and escape tests more strategic and meaningful than was true previously, and the addition of cards with higher escape values has also raised the stakes. While this does not rank among the most difficult of the Nightmare packs, it is a vast improvement over the original in terms of difficulty and fun factor. Like The Hills of Emyn Muil, this ranks as another quest that has been rehabilitated by Nightmare mode, and that is enough to make it one of the best buys around and one of my personal favorites. Overall Thoughts: Unlike some of the other quests in the Mirkwood cycle (i.e. The Hunt for Gollum, The Hills of Emyn Muil, etc. ), Return to Mirkwood is actually a decent quest in its original form and doesn’t need much improvement. If there is one main flaw, it’s that this quest definitely caters to the multiplayer crowd and has always been rough on those who play pure solo. This is true not only in terms of raw challenge, but also in that one of the fundamental strategic mechanics of the quest, the ability to change the guardian of Gollum, is rendered completely meaningless with only one player. Unfortunately, if you’re expecting the Nightmare version of this quest to fix that problem, you will be disappointed. If anything, this version is even more brutal for pure solo players, and provides one of the most impressive challenges currently available in the game (things are much more manageable in multiplayer). Still, what Nightmare Return to Mirkwood does do well is enhance what the quest already does well by emphasizing the theme and strategy revolving around guarding Gollum and dealing with his tantrums. 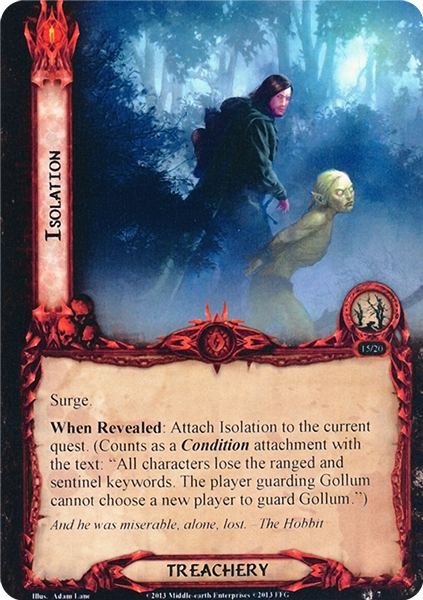 The introduction of recursion for the nasty Tantrum treacheries, as well as exhaustion and attachment hate, makes this quest an even more breathless race to the finish and places a premium on smart deck building and decision-making revolving around rotating Gollum between players and deck types depending on the current game state. I will say that this isn’t my favorite Nightmare quest around, but I think that’s more a function of my ambivalence towards the original version, and the fact that this is more of a Return to Mirkwood 2.0 than a complete re-imagining, as with some of the other Nightmare packs. Overall Thoughts: The three Nightmare scenarios of the Khazad-dum expansion actually were released as one big pack, rather than three separate packs, so I will review them as a complete package. In retrospect, there’s a lot to like about the old Khazad-dum quests. They are relatively straightforward and simple, but force players to strike a nice balance between questing and fighting off hordes of smaller goblins. At the end of the day, this can make you feel like a true hero, cutting your way through swathes of hapless foes, but unfortunately as one’s card pool grows, the challenge provided by these quests diminishes. Fortunately, Nightmare mode has come along to refresh this deluxe expansion and make it playable again for experienced players. In this way, it is a definite success. While these Nightmare quests didn’t test me as severely as some of the others on this list, and while they do not completely revamp the scenarios in terms of theme and gameplay, they succeed in the most important category: fun factor. In fact, these just might be my favorite Nightmare quests yet from that perspective. Nightmare Into the Pit puts a limit on the Cave Torch, removing it from play after five uses. There also are some new enemies and locations that key off of the state of the Cave Torch (whether it is exhausted, in play at all, etc.) and this does add some tension and definite flavor as you can imagine the torch slowly flickering out in the deep darkness of Moria. However, I’ve found in all of my plays of this quest that I have yet to burn out the torch completely, although I have found myself using it more than before. The real value in this particular scenario is the new foes and locations that make questing and combat more difficult. It also includes one of my favorite Nightmare improvements: the addition of a new quest card. The new stage 2, Goblin Ambush, provides some real meat to the middle of the quest in terms of adding more enemies to the party. Nightmare The Seventh Level introduces a new mechanic whereby enemies can gain resource tokens, which give them added stats and potential damage cancellation. The latter, provided by the Orc Taskmaster can admittedly be frustrating, especially in multiplayer where more resources are likely to be accrued. When you cut away at enemies but are unable to kill them because of resource tokens, this can often feel more frustrating than fun. Still, when everything hits right in this scenario, it does perhaps the most of the three to transform a simple and relatively easy scenario into one that is more challenging and interesting. Most notable is the addition of a new “boss” enemy, Overseer Maurul, and “boss” location, the Chamber of Records. Finally, Nightmare Flight from Moria adds in 3 new quest cards, makes the Nameless Fear into an even greater threat, and adds penalties for bypassing quests. Ultimately, though, whether you enjoy this scenario will likely depend on whether you liked the original version. Critics of Flight from Moria point to the randomness of the quest stages and the disproportionate effects this has on ultimate success and failure. This is an absolutely valid criticism, and nothing has been done to change that here. I’ve played the Nightmare version and breezed through because I hit the right quest stage immediately, while other times I’ve been buried by pulling the nastiest stages instead. Still, I think I have a higher tolerance for random factors than many players, and I’ve always enjoyed this quest because of the very different stories it can tell. The new quest stages are a ton of fun, including one that allows you to escape in a new way (by withstanding attacks from the Nameless Fear via A Foe Beyond) and one that allows you to actually engage in combat with the Balrog. Overall, the Khazad-dum Nightmare pack provides great value, with 3 scenarios for one price and should be one of your first Nightmare purchases. Overall Thoughts: I’ve always had a fondness for The Redhorn Gate. The snowy wilderness of this quest is a unique setting in the game and reflective of a memorable moment of The Fellowship of the Ring. In addition, it really punishes low willpower characters (to say the least) in a way that is not typical. Unfortunately, like many quests, it hasn’t aged well as the card pool has grown, as it is now possible to build decks that can beat it with ease. This is where Nightmare Mode comes along and, for the most part, the Nightmare version of The Redhorn Gate does an admirable job of maintaining the theme and feel of the quest while adding more difficulty. In particular, the scenario badly needed some more challenging enemies, and we now have a formidable Snow Giant to deal with, which cannot be avoided. If you choose just to leave it in the staging area, it will attack you anyway, but if you choose to take it on, it forces you to discard the ally with the highest willpower, undermining your attempts to simply rush through the quest. The other new enemies, Silvertine Marauder and Wolfpelt Goblin, aren’t quite as daunting, but they at least interact with the central mechanics of the quest, willpower and locations, in interesting ways. The locations and treacheries both add new twists, while maintaining theme and the feel of the quest through stellar artwork and intriguing effects, but they don’t necessarily ramp up the difficulty all that much. Blinding Blizzard, for example, is really cool, in that it is a treachery that almost acts as a location, sitting in the staging area until 5 progress tokens are placed on it through questing, and preventing resource collection until it is discarded. 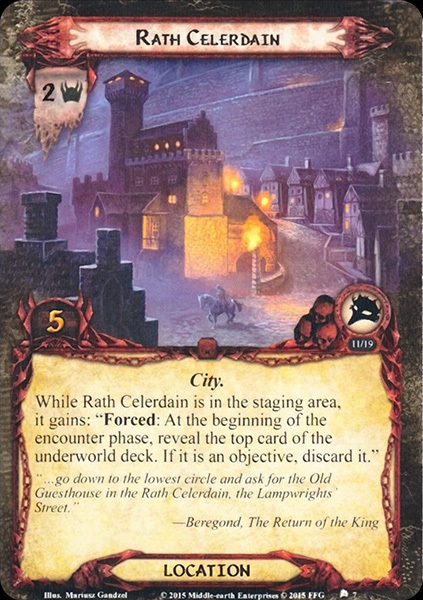 While I love this idea, and would like to see more treacheries that mimic other encounter card types, the standard approach to The Redhorn Gate of using high willpower and massive quest pushes should get rid of this treachery in short order. So in general, while I find this Nightmare quest a worthy addition to player collections and definitely a more challenging version of the scenario, it isn’t as punishing as others and doesn’t necessarily shake things up in a major way. Overall Thoughts: Road to Rivendell is perhaps unfairly remembered (or fairly, depending on your perspective) mainly for the viciousness of Sleeping Sentry, both as a treachery and shadow effect. There is no doubt that Sleeping Sentry is overpowered compared to most other treacheries in the game, and the shadow effect is even more ridiculous, in my opinion, causing you to discard all exhausted characters, including heroes! On the other hand, one could argue that Sleeping Sentry is a constant danger that one must be vigilant against, to match the theme of the scenario, and adds an edge that would otherwise be missing. Whatever your perspective, the first thing to know about the Nightmare version of Road to Rivendell is that you’ll still have to deal with Sleeping Sentry in all its infamy. However, if you’re able to move past that point, this version of the scenario is far better than the original. For one, it fixes the ambush keyword so that it no longer rewards players by removing threat from the staging area during questing. Now, this threat still counts during the turn an enemy with the ambush keyword enters play. Second, a band new stage 2 has Arwen get captured by Orcs and she must be rescued to proceed. Not only do I love when Nightmare quests introduce new quest stages, but this one is a nice nod to the lore, since Arwen’s own mother was captured and tormented by Orcs, an experience that ultimately drove her from Middle-earth. There are several new enemies, all of which play off of the ambush keyword as well, and the new Nightmare locations and treachery also reinforce this aspect of the quest as well. In general, this has the effect of making the scenario feel more distinct form others and really highlights the ambush mechanic far more than the original. In terms of difficulty, this one falls somewhere in the middle. The new Nightmare cards do add some bite, but ironically I found one of the original cards, our good friend Sleeping Sentry, to still be the biggest danger and point of strategy. Due to the nature of the quest as a whole, in both its original and Nightmare forms, I can’t recommend this one if you really don’t like single cards and turns of fortune that can completely wreck a game. On the other hand, if this isn’t enough to dissuade you, then you’ll find a fun and relatively straightforward quest that is an improvement on the original. Overall Thoughts: The original version of The Watcher in the Water is still one of my favorite quests. I love “boss quests” and this scenario was the first to really tackle that idea in a substantial way. However, it has not aged that well with the growth of the card pool, unfortunately, as steady power creep has meant that this scenario does not pose enough of a challenge anymore. This sounds like a job for Nightmare mode, and generally this new version does a laudable job of making improvements all around. 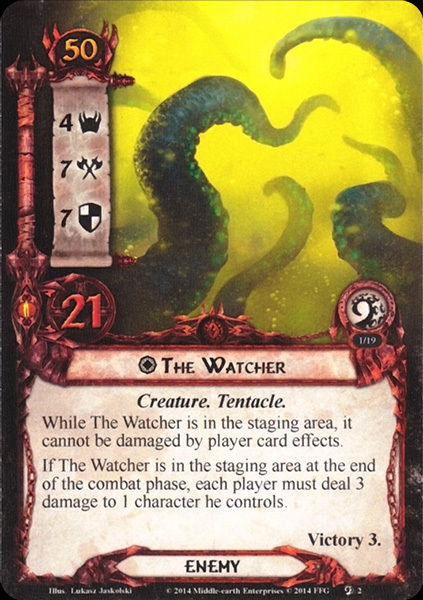 First off, there is actually a brand new card for the Watcher itself, one that has far beefier stats than the original. As a point of comparison, the original Watcher had only 9 hit points, while the new version has 21 hit points. Beyond a new edition of the boss to grapple with, there are also two new tentacles to plague players. The Writhing Tentacle can potentially make an immediate attack when engaging a player (depending upon a flip of the encounter deck), and if it does so, then it will attach to the defending character, preventing it from committing to the quest. The Choking Tentacle can also attach to a character, dealing 1 damage to it every time it readies. Both are more dangerous than the original tentacles in terms of stats as well, but I didn’t find them too troublesome overall, assuming you have some decent combat capability (and healing helps as well). The fact that they can remove themselves as a combat threat and become attachments can actually benefit players. However, there are some other nasty locations and treacheries that can up the ante when it comes to tentacles, from Pulled Under, which deals damage to characters with tentacle attachments, to Banks of Sirannon, which increase the defense of tentacles, making them more difficult to kill. Generally, in multiplayer, these effects will have a greater chance of combining together to really challenge players. One interesting twist to this Nightmare version is that players must now both unlock the Doors of Durin and kill the Watcher, potentially making for some tense finishes, although it is still fairly simple to pop open the doors with some scrying, although the new location, Hideous Depths, does provide some kind of counter to this strategy. All in all, Nightmare The Watcher in the Water is a better and more challenging version of an old favorite. It is not on the highest end of the difficulty scale, but can definitely chew you up if the cards aren’t kind. If you liked the original quest, then you’ll definitely like this one. If you didn’t like some of the random elements of the original, then you probably won’t like this Nightmare pack. Overall Thoughts: The Long Dark was probably my least favorite pack of the Dwarrowdelf cycle. Not only was it far too easy in solo play, it also had very little flavor to distinguish it from other quests. In fact, it seemed a less interesting retread of the Khazad-dum expansion. Still, there was potential there, particularly in the idea of Lost tests simulating the experience of getting hopelessly lost in the long dark of Moria. Does the Nightmare version of The Long Dark realize this potential? Yes and no…but mostly yes. The enemies in the quest have definitely received a big boost, with nasty new foes like the Goblin Stalker, which gets boosted by the “PASS” keyword, or the Trapdoor Spider, which discards any character it damages. These enemies definitely add some teeth and interest to the quest that it was previously lacking, particularly in solo play. On the other side of the equation, a couple of new high threat locations make it more difficult to blow through the quest stages quite as quickly as before, while also making Lost tests more difficult by requiring further Lost tests (Eastern Mines) or forcing players to discard cards (Bottomless Chasm). This turns out to be pretty effective in making Lost tests more meaningful and more difficult. The bad news for solo players is that this quest is boosted up to a decent level of difficulty, but not to a truly Nightmarish level. Multiplayer is a different story, where players will be able to appreciate a robust challenge. Overall, this might be one of the better Nightmare purchases for the Dwarrowdelf cycle purely from the perspective of making a quest playable that might otherwise just simply gather dust in your storage solution of choice for all of eternity. Overall Thoughts: If The Watcher in the Water is one of my favorite quests from the Dwarrowdelf cycle, then Foundations of Stone is one of my top 5 quests of all time. As such, I was a bit nervous to see how Nightmare Mode would change it up, but also excited at the possibility of getting a more challenging version of a classic. The designers have not disappointed, and they have upped the ante to such a degree that this is one of the most difficult of all the Nightmare scenarios. One of the main reasons why is because the new Nameless enemies that have been added are brutal. 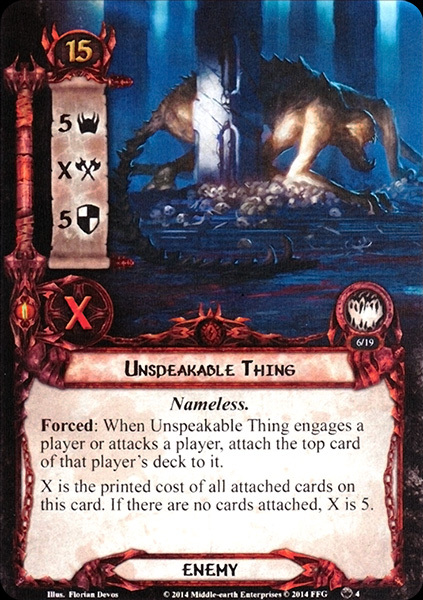 The Unspeakable Thing has 5 threat, making it difficult to quest past, with 5 defense making destruction difficult. On top of that, it has a base attack (and hit points) of 5 when no cards are attached, but it gains an attached card when it engages and every single time it attacks. If you can’t kill it quickly, which is likely to be the case, it can soon grow into a behemoth that will destroy everything you hold dear. The Unspeakable Thing is made even more formidable by some truly chilling art. I would not want to run into this creature in a dark corner of the world. The Primeval Thing is similar, but actually starts with 6 in each stat as a minimum and attaches cards from the first player’s deck until its X value is 6 or greater. It is not just Nameless enemies that pose a danger though. The Nightmare version of this quest introduces a new wrinkle to the moment of separation in that players can only keep 6 resources worth of allies when stage 3 hits and must discard the rest. This directly counters any strategy revolving around turtling during the first couple of stages to prepare for the Nameless enemies later on. Of course, because the randomness of quest stages plays a big part in this quest, the true difficulty will depend upon what stage you end up drawing. If you happen to fall into an Old One Lair, you are probably not going to get out alive, as the new Nameless enemies will probably swarm you too quickly and death will soon follow. On the other hand, if you draw one of the less dangerous quest stage, you may have a chance to blow through the quest before things get out of control. Taking this all into account, Nightmare Foundations of Stone does a great job of adding difficulty while also enhancing the theme of the quest by making the Nameless creatures you face truly terrifying. If you get easily frustrated by hard quests, though, and aren’t looking to bang your head against the wall many times before victory, then this might not be for you. 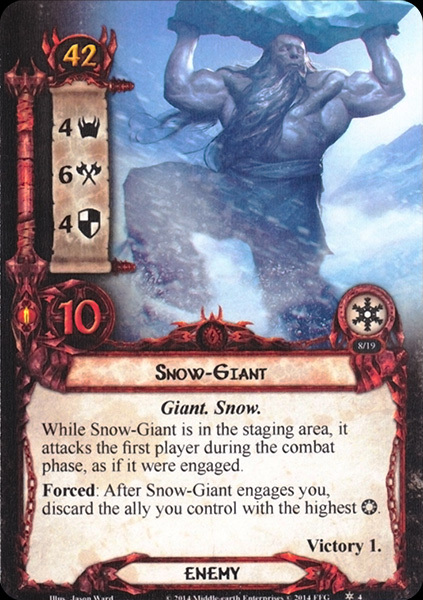 Overall Thoughts: Long before players faced down the Balrog as part of The Lord of the Rings Saga Expansion, the Shadow and Flame Adventure Pack aimed to provide the ultimate boss fight against Durin’s Bane. Largely it succeeded, with the most difficult single enemy players had ever faced (with the exception of Smaug) making for a meaty challenge along with a thematic victory condition that felt satisfying. Generally, players were able to beat this quest either by mustering an army of chump blockers or by building up one hero as a super defender. The Nightmare version of Shadow and Flame takes aim at both of these strategies by introducing an innovative new “Balrog deck” that generates shadow cards for Durin’s Bane instead of the encounter deck. These new shadow effects are all quite nasty. 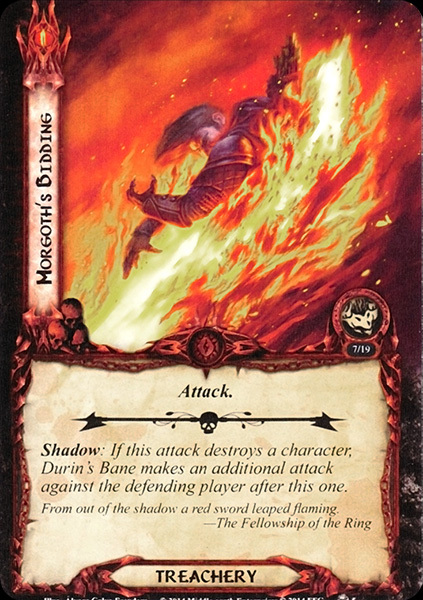 Morgoth’s Bidding, for example, causes Durin’s Bane to make an additional attack if the defender is destroyed as a direct counter to chump blocking. Blazing Grip aims for the super defender strategy by causing the defending character to discard all attachments, chucking that copy of A Burning Brand or Gondorian Shield or whatever other attachment that you foolishly thought would keep you safe. A separate shadow card deck for a boss enemy is a neat way to increase difficulty and does succeed in making Durin’s Bane more terrifying. One drawback, though, is that this means that there are fewer new treacheries, enemies, and locations. However, the ones that are included are suitably challenging and make questing more difficult due to high threat, while also preventing players from being able to singlemindedly focus on combat with the Balrog. A review of Shadow and Flame can’t be complete without mentioning the elephant in the room. 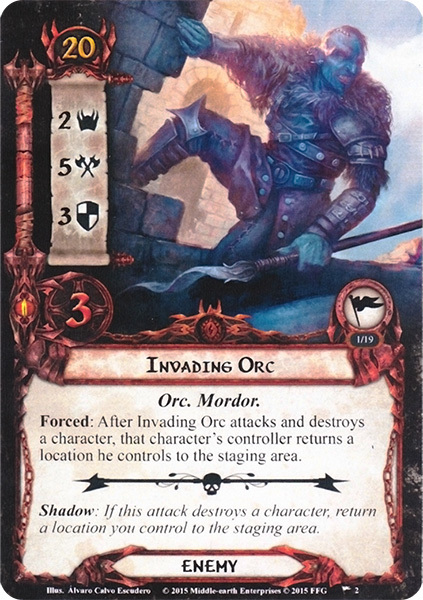 Since Durin’s Bane is not immune to player card effects, the original quest could be easily neutralized by the “Hama lock” deck, which consisted of using Hama to endlessly recycle Feint and/or Thicket of Spears to prevent the Balrog from ever attacking. This has not been directly fixed through new scenario rules (although the errata to those cancellation cards did part of the job previously), but there is one location that indirectly addresses the issue by increasing the cost of event cards. Unfortunately, the new Galadriel hero provides a brand new means of dodging Durin’s Bane and other threat reduction tricks, such as Nori/Dwarves can be just as effective. Still, this is a tough quest if you are not using those tricks and well worth a purchase if you’re itching for an epic boss encounter. Overall Thoughts: The three scenarios of Nightmare Over Hill and Under Hill, like the Khazad-dum quests, come as one pack. Overall, these quests focus more on enhancing challenge than adding to theme or fundamentally changing gameplay mechanics. The difficulty for Nightmare design here is that these are fairly new quests that were already quite solid and thematically satisfying. It thus doesn’t make much sense to radically change things, but the end result is that the Nightmare versions don’t end up feeling as necessary or make as big of an impact as some of the others. Nightmare We Must Away, Ere Break of Day does not bring in new troll enemies, rather it sets its sights on aggressively countering the main strategy for defeating this scenario, which is to slowly build up one’s forces before moving to stage 2. It does this by increasing player threat, hating on allies, and actually forcing the players to advance to face the trolls. While most of this is well done, and I love when the designers take on the role of our “opponents”, but the latter effect is accomplished heavy-handedly by a treachery, Mince Them Fine, that leaves players with little choice but to cancel it or perish in most cases. Unfortunately, this ruins the Nightmare version a bit for me, and you can read more about my experience and strategy here. Nightmare Over the Misty Mountains Grim mainly intensifies the direct damage of the Stone-Giant section of the quest, while also making questing more difficult. The goblin portion is intensified through the addition of a new Great Goblin enemy, which is much nastier than the original version. I find that this is the best aspect of the Nightmare version, as the battle against the Great Goblin and his minions feels much more tense and tough than the original. This brings us to Nightmare Dungeons Deep and Caverns Grim. Players will likely want to know one thing first: have the riddles been changed? The answer is a definite no. The riddle mechanic has not been modified at all, and in fact there are some brand new riddles that are even more nasty, such as one that forces you to name a card by title! While this will be a disappointment to those who feel a deep antipathy to the riddle mechanic, it is perhaps unrealistic to expect the Nightmare version to be able to completely change a core aspect of the scenario that is built into almost every card. Mostly, this quest is simply more difficult, with some tougher enemies and effects that make Gollum into a greater menace. Unfortunately, if you truly hate this scenario, there’s nothing here that will save it for you, but I actually don’t mind it too much, and this is a more challenging version. Overall, this pack is not the strongest of the Nightmare releases, simply because it feels like harder versions of the same quests rather than anything truly different. Keep in mind that I love all the Nightmare packs, so even one that gets low ratings is not terrible by any means, but other choices on this list might be a better first buy. Overall Thoughts: The Nightmare expansion for Over Hill and Under Hill received a fairly lukewarm review by my standards, so how does the nightmarish second half of The Hobbit Saga fare? Overall, it is the better of the two Nightmare Hobbit sets, although this may simply be a function of the On the Doorstep quests being stronger than the OHaUH ones in their basic form as well. On the other hand, like Nightmare Over Hill and Under Hill, this Nightmare set does not fundamentally change the overall quests, and doesn’t add anything really new other than increased difficulty. Nightmare Flies and Spiders plays on the central mechanic of the quest by both giving out poison more frequently and imposing harsher penalties for those characters that are already poisoned. If you liked the original version of this quest (like me), then you’ll probably enjoy this more challenging version. If you felt like the original was too random or already too difficult, then these new cards won’t make you happy. Nightmare The Lonely Mountain is similar to Nightmare Dungeons Deep and Caverns Dim in that it does not alter a somewhat controversial and random mechanic (burgle tests in this case), and actually makes them more difficult. Still, burgle tests were never quite as hated as riddles. What I really like about the Nightmare version of this quest is that it forces you to steal all five Erebor treasures in order to win. Of course, you could do this yourself with the normal version, but the requirement does add quite a bit of challenge. If that wasn’t enough, Smaug is now more unpredictable and can attack even when you’re on stage three instead of stage four thanks to a couple new cards. Finally, Nightmare The Battle of Five Armies takes a quest that is already difficult, especially in multiplayer, and makes it damn near impossible for three or four players (I’m exaggerating a bit, as it can be beaten, but only with extremely well-tuned decks or the most overpowered ones). Again, you get more difficulty here, but not anything substantially different from the original quest. If you loved On the Doorstep, this pack isn’t a bad purchase, but if you are looking to be selective, I would put it towards the bottom of your list, along with Nightmare Over Hill and Under Hill. Overall Thoughts: Heirs of Numenor is one of my favorite expansions ever released for this game, bringing a bigger scale to the game and introducing the “battle” and “siege” keyword. At the time it was released, it also upped the ante in terms of pure challenge, to the point of frustrating some players while satisfying those who wanted a nightmarish experience before Nightmare packs even existed. Now that the card pool has expanded, however, and players have learned how to deal with each of the Heirs of Numenor scenarios, it doesn’t pack the punch it once did. Granted, something like four player Into Ithilien can still be dangerous, but overall the quests in this expansion have become, dare I say, “easy”. In addition, although I am a fan of Heirs, there are certain glaring gameplay exploits and strategies that stand in the way of theme, and these needed a fix as well. Nightmare Heirs of Numenor satisfies both counts, adding difficulty while also making each scenario more thematically satisfying and freeing them of incongruous holes. Nightmare Peril in Pelargir tackles the issue where players benefited from dropping Alcaron’s Scroll as soon as possible, which made no sense in terms of theme (oh look, a valuable scroll…drop it right away! ), and fixes it by having enemies pick up the scroll if it is unattached. If the players don’t recover it, then an enemy can eventually run away with it, causing the players to lose! In practice, I did still find it advantageous to let enemies take the scroll for a bit and then kill them in time to recover it before they got away, but overall the change works well. Interestingly, this version of the quest, while being more difficult, also removes Collateral Damage, which was one of the key cards that made original Peril in Pelargir hard, but also was arguably unfair and an exceedingly frustrating way to lose. In this way, the designers have chosen to not just amp up the difficulty as much as possible (otherwise, they would have left Collateral Damage in the deck), but to improve the overall experience instead. Nightmare Into Ithilien takes one of the most notoriously difficult quests of its time and adds enough challenge to give current decks a run for their money. The Ithilien Overlook, for example, is a location that not only adds its own archery damage but requires all archery damage to be assigned to once character until it is destroyed. In general, a heavy focus on archery damage can be found here. In terms of thematic fixes, letting Celador die and taking the stage 2 route is no longer a potentially smooth road to victory. 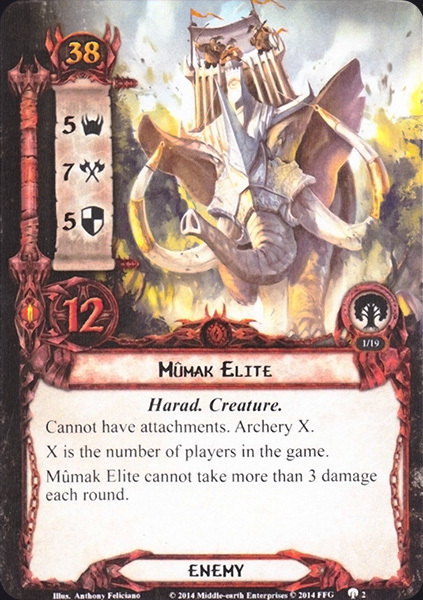 Now doing so brings out the incredibly tough Mumak Elite, which becomes incredibly punishing when paired with another copy of Mumak Elite that is automatically revealed as part of the final stage. Although this change does take away some choice, it also rewards you for keeping Celador alive and enhances the theme/narrative of the quest. It’s also important to note that, as with Peril in Pelargir, an annoying treachery has been removed, in this case the hated Watcher in the Wood. Finally, Nightmare The Siege of Cair Andros adds new battleground locations, along with tougher enemies and locations, making it a bit more difficult for quest-specific mono-Tactics decks to simply steamroll the scenario, which was previously the case. Overall, if you enjoyed Heirs of Numenor, but now find it a bit too predictable or easy, this Nightmare pack is for you. In fact, because it fixes some serious thematic/narrative issues and removes unfairly frustrating cards, this rates as one of my top must-buy Nightmare expansions. Overall Thoughts: The Steward’s Fear is considered by many players to be one of the best quests ever released, and I would agree with this sentiment. It has a ton of replay value with three different plots and three different villains, shakes up the regular quest rhythm via the underworld deck, and is quite challenging in solo play. The Nightmare version of this quest doesn’t seek to mess with this formula, but rather adds more of what was already appealing about it. With this mind, there are two brand new plots that change the way a particular playthrough turns out. Rise to Power places mounting threat in the staging area, representing one of the conspirators slowly consolidating power. Assassination is even more thematic, as it attaches to a hero and marks them for death! In game terms, this means that the targeted hero cannot heal and must suffer the damage from undefended attacks and Knife in the Back, and if they are killed, the players lose. The villains also get some love, as The Cabal’s Champion is a new encounter deck attachment that can boost the stats of a villain, making them more difficult to kill. If all that wasn’t enough, the new enemies and locations that are included have high threat and nasty effects, making every round of questing a tricky proposition. Altogether, Nightmare The Steward’s Fear is one of the most challenging experiences available for the pure solo (one deck) player, and it proves difficult for multiplayer games as well. With new plots and a tougher challenge, Nightmare The Steward’s Fear should be one of your first Nightmare purchases if you are the kind of player that doesn’t get bogged down in frustration, but rather relishes the most difficult scenarios. The one caveat is that if you didn’t enjoy the lengthy pace of The Steward’s Fear, there’s nothing here that will likely change your mind. 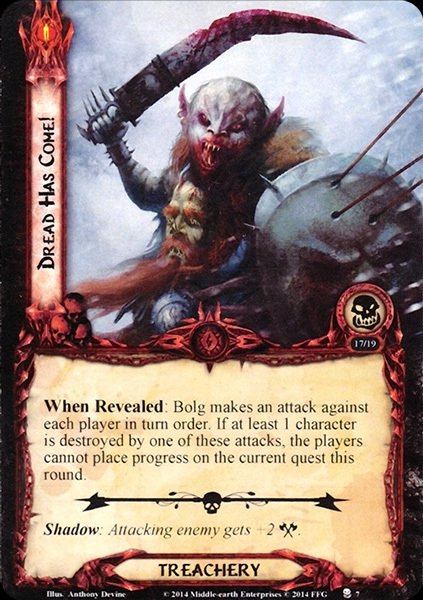 Overall Thoughts: The Druadan Forest is one of the most unique quests in the game, featuring Wose “frenemies” that do not appear in any other scenarios, as well as a prowl mechanic that saps player resources. This is a quest whose difficulty is highly dependent on the number of players, as solo games are extremely easy while multiplayer games can become exceedingly punishing. The Nightmare version of The Druadan Forest certainly increases the difficulty for solo play (while obviously doing so for multiplayer as well). However, it’s not just about difficulty, as this Nightmare pack alters the original quest in one of the most innovative and creative ways that this game has ever seen. The normal structure of the game is fundamentally changed in that each hero starts out with five resources, but on the flip side heroes no longer collect resources during the resource phase (they do get a refresh in the second stage and can generate resources through card effects). This new rule means that you start out with an amazing surplus of resources, but have to make careful decisions about when to spend them, how to spend them, and how many should be saved to satisfy the encounter deck’s thirst for resources (remember that you are often punished for not being able to pay resources to satisfy certain encounter card effects). Not only is this intriguing in terms of gameplay and rewards a carefully thought out strategy, but it really enhances the theme of the quest, as you enter the forest with your supplies, but then have to watch as they dwindle away or are stolen. This kind of totally thematic change to normal game structure is certainly welcome. Returning to gameplay, there are several new enemies and locations that make it even more punishing for your heroes to be without resources. The Druadan Warrior, for example, cannot be attacked or defended against by a hero with no resources, which can be devastating when you consider that the this enemy has five attack (ouch). The Druadan Stalker has archery 3, but can only be optionally engaged if you spend 2 resources. As for locations, Eilenach has 5 threat and can only be traveled to if there is at least 1 resource in each hero’s resource pool. Altogether, this is a tough quest that can be beaten with finely honed decks. More importantly, though, it is dripping with theme and strategy. Overall Thoughts: Encounter at Amon Din was one of the most interesting scenarios of the Against the Shadow cycle, but it was hampered by one major flaw (depending on your point of view): it was too easy. Centering a quest around rescuing villagers represented by villager tokens is certainly a great concept, enough so that I often have played the original scenario of the version for fun even though victory was usually fairly certain. Nightmare Encounter at Amon Din’s main job then is to add to the challenge while maintaining the theme and unique mechanics. The biggest change is made by the Nightmare setup card itself, which prevents you from dealing damage to Ghulat during the second stage until all 15 progress tokens are placed. This alteration totally messes with how the quest usually plays out in that you can’t simply kill Ghulat in one term, but instead have to deal with his potentially ludicrous attack strength (which is based on the number of damage tokens on Dead Villagers) over several rounds. Aside from that switch, the new Nightmare cards focus mainly on one thing: discarding villager tokens and getting damage onto Dead Villagers. It does this very well, so that, unlike the original version, the dead villagers really pile up and the ultimate outcome of the game often remains in doubt until the very end. Trapped Villagers, for example, is a treachery that places 3 damage tokens on Dead Villagers immediately, unless it can be cancelled. 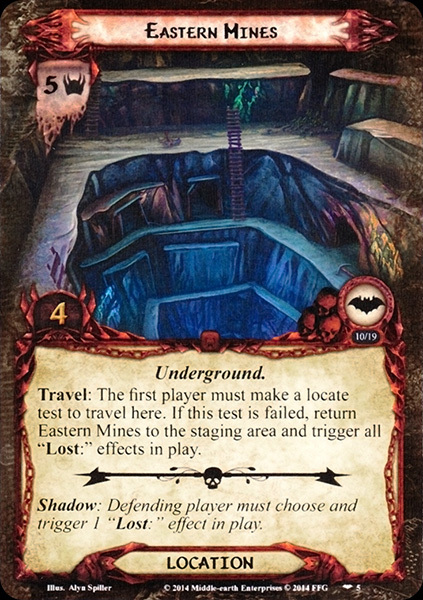 Nightmare Encounter at Amon Din is therefore a superior version of the original quest and a good buy if you want to quickly improve the Against the Shadow portion of your collection by upping its difficulty to an appropriately challenging level, thus plugging/fixing a “hole” in it. Overall Thoughts: Assault on Osgiliath was probably the Adventure Pack from the Against the Shadow cycle that I was most excited about before its release, with its promise of immersing players in a grand and strategic battle to take back the city of Osgiliath. In practice, there were some enjoyable aspects of the quest, but it also featured some glaring flaws that dramatically dampened my enjoyment. Most notably, in solo play a simple exploit focused around Tactics Boromir and the Ancient Harbor unique location gave players the opportunity to win the game in a single round. Even beyond this loophole, the fact that victory depended on controlling all Osgiliath locations meant that each particular game could vary dramatically in length and difficulty. This experience didn’t make for a consistently enjoyable quest. The Nightmare version has fixed this aspect of the quest by introducing a new unique Osgiliath location, Palace Remains, that cannot be traveled to until 5 other locations are taken control of by the players. In this way, there is a bare minimum length to the quest and a more consistent experience. This new feature goes a long way towards improving the quest overall and making it one that I will actually want to pull out. Of course, there are the usual array of tough new enemies, locations, and treacheries to make the general experience more difficult. The final verdict is that this is one of the must-buy Nightmare expansions of the Against the Shadow cycle, which is saying something considering their overall excellence, mainly because it fixes the most glaring hole in the cycle. Overall Thoughts: The Blood of Gondor was a scenario that I originally didn’t think much of, although this was likely a matter of timing more than anything else, as it was released at the same time as The Black Riders. Over time, I’ve come to appreciate the hidden cards mechanic and the strategic choices that are required of players, but it does still lack some of the unique flavor found in the rest of the adventures in this cycle. 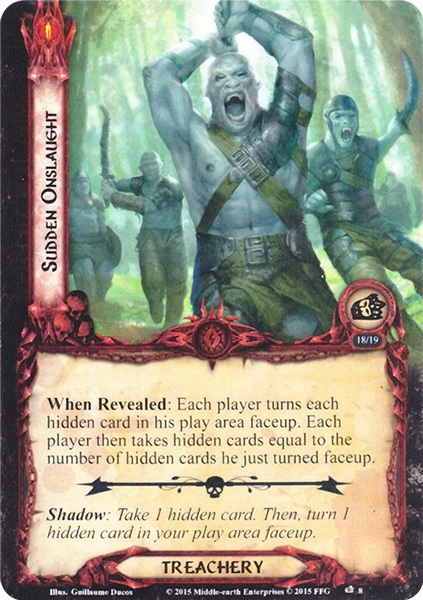 Although Nightmare The Blood of Gondor does not make any dramatic changes to the quest to enhance theme or gameplay, it does increase the difficulty and places the focus even more tightly on the hidden cards mechanic. 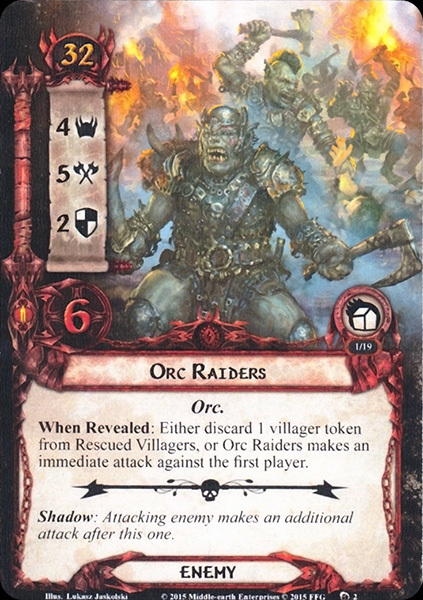 The Orc Trickster is most representative of this pack, as it is a 3 attack enemy that makes an immediate attack when it is turned faceup as a hidden card. If that wasn’t enough, instead of being damaged, it becomes a hidden card again for a random player. Similarly, the Uruk Marksman deals 3 damage to a character when it is turned faceup as a hidden card. With all of these new Nightmare cards working together, the stakes have been raised for revealing hidden cards so that anytime you choose to reveal them (or are forced to reveal them), it is an extremely tense experience. In addition, the “boss” for this quest, the Black Numenorean, was fairly easy to dispatch in the original version of The Blood of Gondor. There is a new Nightmare version of the Black Numenorean that is much more of a challenge, requiring 13 total attack to defeat rather than 8, and turning all hidden cards in front of you faceup when you engage him. These changes make Nightmare The Blood of Gondor an enjoyable experience that requires careful strategic decision-making from players, and can be particularly fun with multiple players. 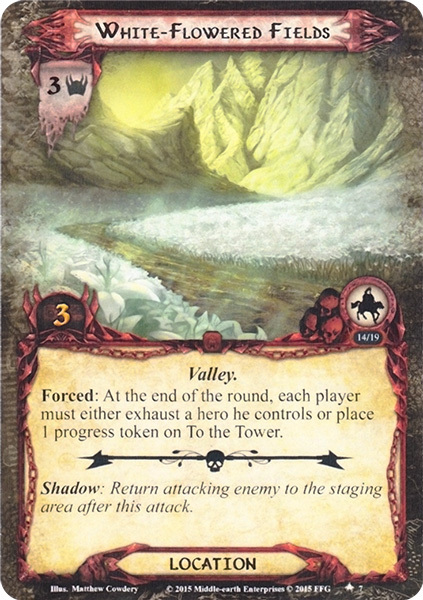 Overall Thoughts: The Morgul Vale is the final pack of the Against the Shadow cycle and is probably the best cycle-culminating quest around in its original version. It is also one of those scenarios that is quite challenging for pure solo players. If there is one valid complaint about The Morgul Vale, it is that the To the Tower objective, which represents the progress your foes are making in carrying Faramir to Minas Morgul, doesn’t feel all that meaningful. Usually, if you lose, it is because of not being able to muster enough questing power or getting destroyed by enemies, rather than progress tokens on To the Tower. The Nightmare pack for this quest aims to remedy this aspect of the scenario by introducing a set of new cards, most of which directly place progress on To the Tower. This change means that progress definitely piles upon To the Tower much more quickly and is a real concern. The other main target of this Nightmare pack is making the three Captains more difficult to defeat. Most notable is the Warrior of Nurn, who not only boosts the defense of Captains by 1 but heals all damage from them at the end of the round. This effect means that you often need to defeat the Warrior before the round is over, but his 3 defense and 5 hit points makes this difficult. 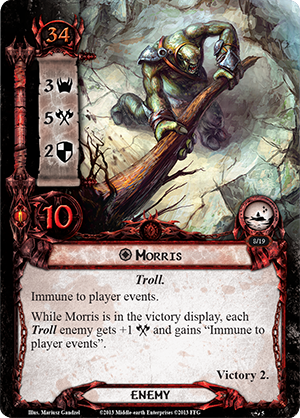 Along with the Morgul Bodyguard from the old encounter set, the Warrior of Nurn forces you to focus on other obstacles other than the Captain enemy in question. There also are Nightmare cards that give additional attack strength or shadow cards to a Captain. 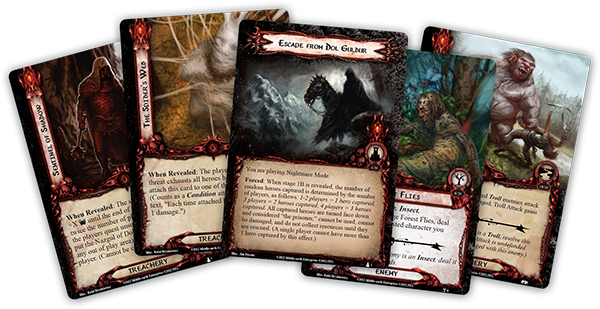 Overall, this is a fine Nightmare pack that adds difficulty to one of the best LOTR LCG scenarios. On the other hand, the original version of the quest is already so good and challenging (especially for solo play), that this expansion might feel a bit superfluous if you’re not intent on collecting them all. Overall Thoughts: In my opinion, the quests from The Voice of Isengard were all pretty mediocre to start with—they’re not bad quests by any means, but they don’t tend to rank near the top of most people’s favorite quest lists. Did the Nightmare facelift manage to revitalize them? Sadly, not by much. The first quest, The Fords of Isen, is my favorite of the three, with a strong focus on making you dread drawing extra cards (and boy does it). The Nightmare version doesn’t mess with this formula, mostly just adding a greater variety of new cards to the existing set and increasing the difficulty somewhat in the process. 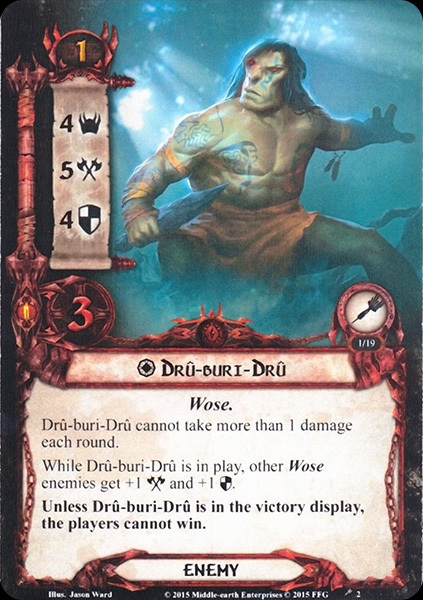 To Catch an Orc has the highest bump in difficulty of the three, adding an extra Orc hiding in your out-of-play deck as well as a nasty new location in the form of Methedras Peak, which has X threat where X is the number of characters the first player controls—always a formula for messing up your questing calculations! It’s also worth noting that while this quest used to drag on for a long time in multiplayer games (since it was often only the first player doing the searching for Mugash at any given time) the Nightmare version attempts to rectify this by having more effects that cause all players to perform search-like effects at once. That could be a big deal for someone who regularly plays with 3-4 players. Into Fangorn was on the easy side of things in its original incarnation, and unfortunately the Nightmare version doesn’t do much to change that. In fact, because it has a thicker encounter deck you’re less likely to see copies of The Forest’s Malice (the Treachery that causes all engaged Huorns to attack) meaning that the Nightmare version might arguably be easier than the original! Difficulty-wise, it’s a lateral move at best. In fact, I’d say that “a lateral move” describes most of these quests in Nightmare mode. They certainly have more variety than their original versions do, and that’s worth something for sure, but I don’t feel like they move the needle much along any axis to really make them stand out. If you are already a fan of these quests, it might be worth picking up the Nightmare versions to inject some fresh life into them. But if you’re like me and were hoping that the Nightmare makeover would elevate these quests out into something you’ll want to break out and play more often, then you’ll probably be disappointed. Overall Thoughts: Even without its Nightmare mode incarnation, The Dunland Trap is a difficult quest. Featuring what is essentially a mid-game board reset, and a quest ability that constantly discards the cards in your hand, it’s no wonder folks had a tough time with this one when it first came out. The Nightmare deck cranks the difficulty dial even further, adding tougher Enemies, some nasty Locations that you definitely want to travel to quickly, and a few Treacheries with some standard Nightmare effects like giving all engaged Enemies an immediate attack. The new cards don’t really do anything too out of the ordinary; they build upon the mechanical themes of the cards already in the deck, mostly opting for stronger stats or slightly meaner effects as a way to make them feel more Nightmarish. The Dunlandings still punish you for drawing cards, and the locations still do bad things to you as long as they’re sitting in the staging area. In some ways, that’s kind of nice—why mess with something that works? On the other hand, if you’re the sort of person who likes a little more spice in your Nightmare decks, it can make this one feel rather forgettable. If you already like The Dunland Trap, but want a little more challenge for the modern card pool, then this Nightmare deck certainly delivers! But if The Dunland Trap isn’t already a quest that hits your table very often, then the Nightmare deck probably won’t do anything to change that. Overall Thoughts: Perhaps the most memorable quest of The Ring-maker cycle, The Three Trials features 3 nasty Guardian boss enemies found at 3 Barrow locations that you must deal with in order to claim 3 Key objectives in 3 different ways. In normal mode, once you figure out a strategy for beating the quest, it’s pretty easy to rack up some consistent wins. Not so in Nightmare mode! The Nightmare version of the quest plugs up a couple of “holes” in the original that allowed you to defeat the Guardian and clear the Barrow during the Trial of Intuition, giving you time to turtle and build up your forces for the rest of the quest. In Nightmare mode, the Trial of Intuition forbids that strategy explicitly, forcing you to weather the full force of the Guardian’s attacks until you manage to locate the Key. The Nightmare card also causes the Guardians to add their threat to the staging area even when they’re engaged with a player, making their threat stat significantly more meaningful. The Nightmare deck even has a few tricks up its sleeve to make the boss enemies tougher: it includes some new Spirit enemies—one for each of the three Guardians—that boost their own stats and those of their matching Guardian as long as the Guardian has hit the table. It’s a really clever way to increase the difficulty of the quest while still keeping the focus on the boss enemies. The result is a significantly harder quest that manages to stay true to what was great about the original and even throws in some new twists. If you liked the original, this Nightmare deck is definitely worth picking up. The only caveat worth mentioning is that the quest doesn’t scale evenly for solo players, an issue made even more prominent with the added difficulty of Nightmare mode. The fewer players you have, the more difficult this quest is going to be, with pure solo being a truly legendary challenge! Overall Thoughts: Trouble in Tharbad is one of those well-rounded quests where you can bring lots of different kinds of decks up against it with at least some chance of success. It’s one of only a few quests that changes the number at which you threat out, with the first half of the quest challenging you to drive your threat down (by placing progress on the quest) faster than the quest reduces your elimination level. The Nightmare version of the quest doesn’t change this formula much, although it does increase your starting threat by 5 and introduces a few additional cards that lower your threat elimination level, which is a fun twist. It also forces you to defeat Bellach at the end of the quest (unlike the original) which makes that particular boss fight feel a little more meaningful. Mechanically speaking, the new cards don’t have much in common with one another, running the gamut from threat-raising effects to high-threat locations with nasty abilities to enemies with statlines that run just a little high for comfort. Thematically, though, these cards double-down on the idea that you’re being hunted through a run-down city by a group of crafty Orcs—there are more dark alleyways, Spies, and even Blood Hounds, all of which paint a clearer picture of what the setting is supposed to feel like. These new cards definitely increase the difficulty of the quest, although not excessively so; the Nightmare version of the quest doesn’t actually remove many cards from the original deck, so its effects are a little more diffuse. In all, I would say that the difficulty of the quest went from “fairly average” to “kinda tough”. The quest is noticeably harder than the original, but it’s not as extreme of a jump as other Nightmare quests tend to be. Nightmare Trouble in Tharbad would make a good purchase if you enjoy the original quest and are looking for an additional challenge, but aren’t looking to get wrecked. Overall Thoughts: The Nîn-in-Eilph features multiple randomized stage 2 and stage 3 cards, with time counters forcing you to switch the stages out for a random one of the same number if you don’t complete them fast enough. The Nightmare version of the quest replaces a stage 2 and stage 3 in the quest deck with something a little more difficult to ensure you don’t get any softballs from the quest deck. But the change of greatest impact is that it forces you to face the quest’s recurring boss, the Ancient Marsh-Dweller, starting on round 1 rather than waiting for you to hit stage 3. This, plus some of the high-HP, low attack, but deceptively dangerous new enemies really crank the difficulty level of this quest up a lot. The original version of the quest was already fairly cohesive from a thematic standpoint, giving you the feeling of trudging through a never-ending swamp. The Nightmare cards play along with the same themes, keeping the quest focused on annoying locations, treacheries that keep the quest deck cycling, and enemies that you can’t seem to kill. The Nîn-in-Eilph tends to get fairly low marks from the community, and unfortunately the Nightmare version doesn’t do anything that is likely to change anyone’s opinion on it. If you enjoyed the original but are looking to really crank up the difficulty knob on it, then this Nightmare pack might be a good choice. But if you aren’t a fan of the original, then the added difficulty that Nightmare mode brings is only likely to frustrate you more. Postscript: Ok, ok, thanks for the buying guide, but I only want to buy 1-2 packs. Which ones should I pick up? As with the New Players Buying Guide, this is a living document that will include new Nightmare reviews as each pack is released. Feel free to share your own reviews below, as well as more specific questions about what to buy! That’s a nice “shop guide” you wrote, sir. I’m still waiting for season 2 here in my country, but I thoroughly enjoyed each NM scenario in the Core Set. Actually I now use as an introduction to new players Passage (tutorial) and NM Passage so they can see how strategies evolve and as a bridge between Journey, so they can see with the trolls another type of strategy. My favorites: Journey and Dol Guldur. I’ve always been more on the difficult side of quests :). That’s a good idea, using Passage and NM Passage as a kind of extended tutorial. I may just steal that! Thanks. This is just what I needed. On the strength of this I have bought the Nightmares for 1-3 of Shadows over Mirkwood. I feel like these quests have aged the most and will benefit from being honed and have been “rescued” as with Passage Through Mirkwood. It’s interesting to see how much the game has developed in a relatively short time. Glad it was helpful! I really like that Nightmare has made these old quests playable again. It’s definitely one of the best ideas that the designers have come up with. Great idea for a buying guide, thanks for doing this. I already have all the core set nightmare decks and the first set of Mirkwood ones are on their way in the mail, but the ones I’m really most interested in (once they’re available for sale) are Hills of Emyn Muil and The Dead Marshes. The original versions of those two quests are most in need of a good makeover, so I’m looking forward to see what they’ve done with the nightmare versions. Thanks! I’ll be adding the last 3 Shadows of Mirkwood quests to this guide sometime soon. I still need to play through Return to Mirkwood myself. As far as THoEM and TDM are concerned, I can tell you that both have really freshened up both quests. Unfortunately, both of them have been banished to the nether regions of my collection for awhile, but now with the Nightmare versions, I’ll actually want to play both fairly often. Woohoo! That’s what I was hoping to hear. Hey Ian, thanks for the guide. By chance, are you updating this soon for the rest of Mirkwood cycle and the Hobbit: Over Hill and Under Hill? It’s definitely on my to-do list as a short-term priority, so it should be updated fairly soon with the more recent Nightmare packs! shame they didn’t fix RTM with some kind of solo improvement – e.g. an objective hero/ally (Aragorn?) who can act as a guardian of gollum. this would’ve been cool. That’s a great idea! I know Nightmare is supposed to focus on adding challenge rather than fixing issues, but it would have been nice to see something like what you suggested. from the Khazad and OHAUH overview it seems that FFG have taken the price/card point on board. How much do these retail for? sorry if i missed the price in the article. thinking of getting back in to this game after a few months off. What is better for a solo (predominatly Tactics-focused) player? The Black Riders or the last Deluxe expansion (one with Sauraman on the front)? To be honest, Black Riders didn’t really hit the spot for me. Lots of people think its great but I found it to be a very self contained box. 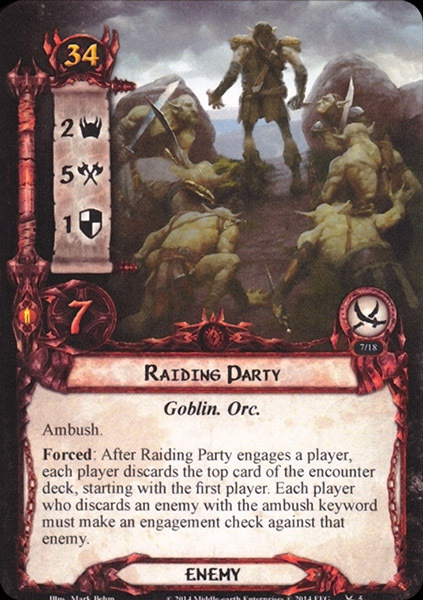 It comes with mainly just hobbit cards that work together but not very well with other decks. And if you are playing solo through those quests, I pretty much always used a hobbit deck due to the theme and also because other decks get smashed against the BR quests. To me, Black Riders felt like its own little thing, much different than other expansions. When I first got it, I played through the quests twice with a hobbit deck and it felt like that was the only way to do it. I haven’t played the quests at all since then. Voice of Isengard might be more what you are looking for. It has some great player cards(a tactics hero that many like). The quests are fine. I’ve seen better. First one is really cool and pretty tough. Its a good fighting quest. The other two are mediocre. I think grabbing Voice of Isengard and the current cycle is the way to go. The price of 3-in-1 packs is 19.95. The choice between Black Riders and Voice of Isengard is a tough one. Black Riders is one of my favorite releases for the game, possibly my favorite ever, and has great quests and player cards. On the other hand, the Voice of Isengard quests are good, but not on the level of Black Riders. However, you do get Eomer, a fantastic Tactics hero. You also get access to all the Ring-maker quests that are coming out, which are great so far. So looking at it from the perspective of getting back into the game, Voice might be a better choice. Then again, Road Darkens is coming out soon, so maybe you might want Black Riders to play a Campaign through both? Now that I think twice about it, I guess he was asking you……sorry to steal the show from you. No apologies necessary! Rating these expansions is pretty subjective at the end of the day, and I think anyone trying to make a decision can benefit from multiple viewpoints, not just my own. So throwing in your own two cents is not only fine, but encouraged! I played the Black Riders last night. Let me tell you why these Saga Expansions *really* annoy the hell out of me: inconsistent application of theme in order to facilitate gameplay. – the whole point of this expansion (certainly in quest 1), as i see it, is to play as Frodo, Merry, Sam and Pippin (when playing solo). Fine. More than happy with that. The problem comes in deck construction. If i am making a ‘hobbit’ deck, i want to include cards like A Good Meal, Second Breakfast, Small Target, Hobbit Pipe, et cetera, et cetera and it’s great that i can include these. The problem is, i am pretty much compelled to include cards which almost entirely break the theme: Steward of Gondor, has no thematic place in this deck, neither does Ghaladhrim’s (sic) Greeting, yet you really need access to these power cards in your deck to stand a good chance of winning. OK – just put Steward and GG in, it’s only two cards, it won’t hurt the theme that much, will it? Of coourse it will! I may as well build a deck with Lore Aragorn, Beorn and Glorfindel and completely destroy this scenario in minutes! So my issue is that if you are going to make a tight, atmospheric thematic expansion, make sure that there are enough cards available so that that can be experienced without suffering from thematic blur caused by, i don’t know, Knights of the Swan turning up to take one for the team from a Nazgul. I had the same issue with the Hobbit quests, it is virtually impossible to use only ‘dwarf’ cards and win the game. I don’t see why we should be forced to sacrifice theme for play ability. players should be rewarded more greatly for sticking closely to theme, and should not be encouraged to ‘stray’ around the edges of theme, in order to reduce threat, generate resources, draw cards etc. Thankyou for reading my rant. I found out something scary on Halloween, and it frightened me more than the prospect of flying through the pit of Utumno itself: Nightmare Heirs of Numenor. And I thought the expansion was intimidating enough . . .
Will you be adding it to the buying guide soon? Indeed! I’m looking forward to the Nightmare Heirs of Numenor pack a great deal. I definitely will be adding it to the buying guide as soon as possible. I still have to catch up with all the Dwarrowdelf packs (not to mention the On the Doorstep ones), but I’ll try to play catch up over the next few weeks. Just want to say your guide helped immensely with my Christmas shopping . . . keep up the good work! And thus a question is sparked…Do you have any tips on defeating nightmare Khazad-dum? I was just smashed in a two-handed game in round two. The East Gate had twelve quest points before set-up was over. Thanks! It’s been awhile, so I can’t quite remember what decks I used. I’m trying to go back to some of the Nightmare quests and play them again to refresh my memory, so I’ll get back to you with what I find! Soon I will have almost everything released for this game (still missing most of the GenCon stuff and also all the nightmare packs). I like to run really strong decks (Outlands/Dwarfs… and so on) and some of the quests so far are too easy. Unfortunately I’m a completionist so for me it’s usually all or nothing. Need to make a decision and was wondering, is there any Nightmare pack you would avoid completely that just adds so little in either challenge or variety that it’s just throwing money down the drain? Most of the Nightmare packs are really well done, but if I had to pick a few to skip, I would say the set of Over Hill and Under HIll Nightmare packs and possibly the Return to Mirkwood pack as well. Of course, this is all subjective, but those were the ones that I felt least excited about after playing. Thanks for answering. I went for everything :P.
This guide really helped me a lot. One question though. Could you please name the nightmare packs that transform regular quests the most. By “transform” I mean the feeling that you are playing completely different, new scenario rather than just a harder version of regular one. – The Steward’s Fear: In many ways, this is essentially the same scenario, but the fact that you get brand new plots and the villains get beefed up adds more replay value to a quest that already has replay value. Thanks for reply 🙂 Sounds like The Druadan Forrest enters my wishlist then. Will it be updated with the Ringmaker cycle and Grey havens? I hit a bit of a wall, unfortunately, between switching jobs, moving, and several illnesses which means it has been a while since I have had a chance to dig out the Nightmare quests again. It is still on my radar, though, and I’m hoping to get back to chewing through the Ringmaker Nightmares in the next couple of weeks.